Welcome to Bolivia! The dream at the heart of Latin America, a country that has been able to chart a course in history, sinking its roots in the ancient rites of the Pachamama, the mother earth. Bolivia, the land of the indigenous peoples who were able to offer an alternative, a new vision of the relationship between man and nature, man and natural resources. A country that still relies on the popular tradition and the syncretism as a remedy for the pains of daily life. Bolivia A colorful and musical tune with its contrasts, from the peaks of the Andes to the Amazon rainforest. Tiwanaku is the symbol of the ancient origins of Bolivia, a meeting of diametrically opposed cultures, a meeting between the sun and the moon, where the extreme material poverty has always been balanced by a huge spiritual wealth. 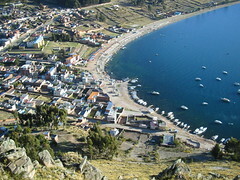 On one side the Lake Titicaca, the Isla del Sol and the bolivian Copacabana. On the other side La Paz and the Yungas, coming soon. Bolivia, a hope for all the souths of the world.